Depending upon how you manage incoming support requests, tickets may be automatically assigned to you, to other agents, and to groups. If you manually evaluate and assign tickets, then assigning yourself, another agent, or a group to a ticket is as simple as selecting the ticket assignee. You cannot assign tickets to light agents (see Understanding and setting light agent permissions). Note: If your account contains only one agent, all tickets will automatically be assigned to that agent. Open a ticket from one your views. You can assign the ticket to a group or to an agent and a group. 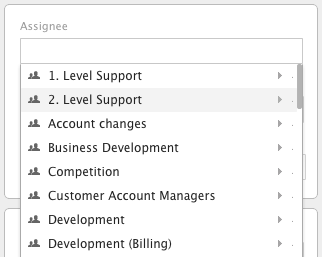 When you click the Assignee field, all of your groups are listed. Select a group or another agent as the Assignee. Click Submit to update the ticket. Click Take it above the Assignee field. You can change a ticket assignee at any time. You can also bulk assign tickets using a view. For example, you can open a view, pick and choose the tickets you want to assign to a single group or agent, and then assign all the tickets in a single step. See Managing tickets in bulk. We've got a problem with a new group we've set up, each time you try to assign a new ticket to this group it automatically is assigned to the requester's group and not to the desired group. Accessing the ticket and re-assigning it to the new group does see the ticket added to the correct group but this is double handling of tickets. What could I have set up incorrectly? Have you created a trigger to assign the ticket? If so, could you show me a screenshot of what you have set up so I can see if something is wonky? I know this is an old post and the issue may have been resolved in newer updates that I already have. But for Brian, couldn't your agents be members of the multiple groups? Wouldn't that solve the issue? Hey David! Thanks for chiming in! Based on Emily's comment, it looks like we were able to determine that there was a trigger running in the background that was messing with Brian's ability to assign to a different group. How do we assign to groups we are NOT members of? The only way I see is to grant all agents access to All tickets, which then they can view ALL other groups/departments tickets. Not ideal. I set up a macro, however it will not save unless they have access to view All tickets. If they do not have access, they will not see them. Then, you would have to create some triggers to assign tickets to the groups. One idea, would be to have a dropdown will all the main groups, when a group is selected a tag would be added to the ticket and then using a trigger you could assign the tickets to the group that they cannot see. Why would a trigger work and not a macro? Under the Enterprise Plan, you can set the role permission to allow assignement to any group. If you would like your agent to be able to assign tickets to any group, you must click the Agent can assign ticket to any group checkbox when creating the agent. When we start working on unassigned tickets, the first thing we do is to assign them to ourselves, which takes them out of other agents' views (each agents works from a view of open tickets assigned to them and open unassigned tickets). However, to get the assignment to 'take' you need to submit the ticket, which takes you to the next ticket (if you are working in play mode or are set up to move quickly through tickets). Is there a way to assign the ticket without doing an extra submit? I have a problem where agents are assigning tickets to their team members when they do not feel like doing it. Is there a way to restrict agents from reassigning tickets that are assigned to them by admins? With this information you can at least take steps to correct this behavior with your agents. Hey there! I faced a problem with assigning tickets. Did he hit the back button? I have had agents not do that so they only see the agents listed in their group. How to make the "Assignee" field mandatory? Right now, we're able to create tickets and save it without any assignee. And, this is very dangerous in case of email tickets, because nobody will be notified if a customer replies and we won't be able to follow up. Is it possible to turn off ticket assigning? So agents are not able to assign tickets unless they are in a certain group? Hi Harriet! Welcome to the Community! If you're on Enterprise and have access to custom roles, you'd be able to set it up so agents in one group cannot assign tickets to another group, but this would still leave them able to assign tickets to people within their own group, so I don't think that would be the right solution for you. Otherwise, there isn't any native functionality that's going to limit an agent's ability to assign tickets. There is an app in our App Marketplace, though, that looks like it might do what you're looking for: Assignment Control. Hi, I am following the instructions in the video re assign a ticket to a colleague but it doesn't move & stays as my ticket. Please help!! Hi Paul! Welcome to the Community! The most likely scenario here is that you're trying to assign to an agent in a different group from you, and your Zendesk Admins have it set up so you can't assign tickets to agents outside of your own group. I'd recommend speaking to one of your Admins about that to confirm! Hi, am I reading it correctly that an Agent cannot assign a ticket to another group unless they are a member of that group? We are using ZendeskHR and I have groups set up for Benefits, Stock, etc, and sometimes an employee sends a stock question to benefits. How can I get that ticket out of the benefits group and into the stock group if the Agents in those groups don't cross over? Agents should be able to assign to other groups, unless your Admin has set something up to prevent that. Hi Nicole, I am the Admin and I don't believe I set up anything to prevent that. What am I doing wrong? I'm not sure, to be honest. Let me do a little poking around and see if I can't find something helpful. Standby. First thing's first, double-check your roles and permissions. Are agents just not seeing the other groups, or is something happening (or failing) when they try to assign it? Hi Nicole, they are not seeing the other groups, but that is as designed as we don't want them to see tickets they are not assigned to. One suggested way to handle this is to create a "reassign" group and invite all of your agents to that, so they can effectively "transfer" tickets from their group into that one and then from there the appropriate team could pick it up and reassign to themselves. You can also use a custom dropdown field and a set of corresponding triggers to send tickets to other groups as specified in the custom field, but that is a more complicated solution. Would be nice to have a feature like this. We have a group for each department, and we've restricted the agents to their own departments (so they can't view another department's tickets). But now, nobody outside of a group can submit a ticket to that group! So if you're in Sales or Accounting, the easiest way to submit an IT ticket is to sign out and then sign back in after you submit the ticket. I understand that the Enterprise plan allows for custom roles, but we have too many agents for a plan that expensive. Is it possible to choose Assignee and Priority from iOS/Android SDK while creating request? Hi Akhil! Welcome to the Community! I'm not sure about this, so I'm going to find someone who can help you out. Stand by!